Tom Hart - ESPN Press Room U.S.
Tom Hart is currently a play-by-play commentator for SEC Network. In fall 2017, he will join SEC Saturday Night, the franchise that features SEC Network’s marquee college football game each Saturday, alongside analyst Jordan Rodgers and field analyst Cole Cubelic. 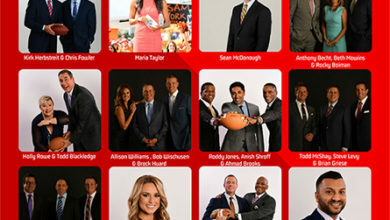 Since joining ESPN in 2012, Hart has called an impressive number of postseason games including the Famous Idaho Potato Bowl, the NCAA Women’s Division I Basketball Championship and NCAA Division I Baseball Championship. He has also called the Meineke Car Care Bowl and Belk Bowl on ESPN Radio. In his first two years, Hart regularly worked ESPNU’s college football games and ESPNU’s Tuesday ACC and Saturday SEC college basketball telecasts. Hart joined ESPN with a wealth of experience, having called more than 1,200 professional baseball games. He continues to work for FOX Sports South and SportsSouth where he serves as pre and post-game host and on-field reporter for Atlanta Braves telecasts. He has previously worked at the Big Ten Network, Fox Sports Radio and CBS College Sports. Hart is a native of Columbia, Mo. and graduated from the University of Missouri. He now resides in Atlanta, Ga., with his wife and three children.